An expression which was very popular among alienated and disgruntled American Army draftees during the Vietnam War era (late 1960s through mid 1970s). The phrase was originally a play on an official (though absurd) U.S. Army advertising slogan urging young males to join the Army for “Fun, Travel and Adventure”. Later, the euphemism “Free The Army” was created for those who were also opposed to the draft and the Vietnam War, but who were too squeamish or polite to repeat the words the soldiers themselves were using. As hostility toward the Army and the War continued to develop, a string of “FTA” cafes began to appear near major Army bases within the U.S. and overseas. In April 1970 a group of anti-Vietnam War activists and actors, including Fred Gardner, Jane Fonda and Donald Sutherland organized a touring “political vaudeville” show called “FTA”, which officially was termed the “Free the Army Tour”, but which was properly understood by all to mean the less respectable phrase. This show was in response to the pro-war USO touring show headlined by Bob Hope. The dialogue from this FTA tour was turned into a documentary film which was directed by Francine Parker and released in 1972. A term used in American imperialist ruling class circles, especially within the military, to refer to the strongly desired total dominance of the U.S. armed forces in all six domains of modern warfare: the three traditional spheres of air, land, and sea, and also the three newer spheres of aerospace, cyberspace, and covert action. The long-term problem for the U.S. ruling class, however, is that this is extremely costly, and as the U.S. economy weakens in growing crisis and the Chinese economy further surpasses the American one, it will soon become impossible for U.S. imperialism to permanently maintain its current full-spectrum dominance. The theory of mind which says that mental processes are functions, actions, aspects or characteristics of the brain (or an equivalent artificial entity such as a very advanced computer). The brain is an extremely complex organ in which there are constant internal changes, many the result of input from the sense organs. These specific changes involve thousands, millions, or even billions of neural brain cells and their varying interconnections and the varying strength of these interconnections. Thus when a human being sees or hears some danger, such as an attacking wild animal, there are a vast number of tiny changes going on in the brain. In conscious beings there need to be systems which summarize all these myriads of tiny brain changes in a high-level way, which will allow the animal to act appropriately and to survive. Mentalistic terms, such as recognition, remembering, fearing, thinking, hoping, wanting and so forth are the names we give to these high-level functional summaries of the internal activities of the brain. Moreover, at different points, the brain will be in different functional states, or engaged in different overall processes. Many of these overall states are also given mentalistic names, such as anxiety, fear, calm, happiness, thought, and so forth. Then too, aspects of the external world (the world external to the brain) will need to be given high-level summary descriptions, such as hardness or softness, sizes, quantity, color, shape and many other categorizations. The complete collection of all these high-level summations of the functioning of the brain, of its internal states, and of our mental perceptions of the world around us, are what we call the mind. Functionalism is implicitly materialist in its basic conceptions, focusing as it does on how the mind is simply a set of high-level summary characteristics of the functioning brain. However, some idealist psychologists (such as Jerry Fodor) have put forward the quite absurd notion that the supposed “minds” of gods, ghosts or other disembodied “beings”, which they imagine could exist, might also be understood in sort of a functionalist way. [For a brief discussion of this see: Scott Harrison, “On the Analogy Between Mind/Brian and Software/Hardware” (1992), section 17, online at: http://www.massline.org/Philosophy/ScottH/mindsoft.htm] The Marxist dialectical materialist theory of the mind is, however, definitely a solidly materialist form of functionalism. See also: MIND-BODY PROBLEM, and Philosophical doggerel about functionalism. “Surely no one who is cognizant of the facts of the case, nowadays, doubts that the roots of psychology lie in the physiology of the nervous system.” [And he went on to say that the operations of the mind] “are functions of the brain”. —Thomas Henry Huxley (“Darwin’s Bulldog”), in his book Hume, His Life and Philosophy, p. 80. Quoted in George Plekhanov, Fundamental Problems of Marxism (NY: International, 1969), p. 34. “The mind is a function of the brain.” —Student’s Library: Psychology (Moscow: Progress Publishers, 1986), p. 25. The Fundamental Contradiction of Capitalism is that between the social character of production and the private appropropriation of what is produced. This is both a profound truth and also a rather abstract statement. What does it actually mean in concrete terms? It means that under the capitalist mode of production workers collectively produce goods but that these goods then do not belong to the workers who make them. Instead they belong to the capitalist owner(s) of the factory and machinery who hired the workers to make the products. But why is this so important? First, it is important because this is the method by which the capitalists exploit the workers. While the workers are paid wages (i.e., paid for their labor-power), the labor they actually perform generates much more value than the value of their wages. In other words, the workers are systematically “ripped off”, systematically exploited, by the capitalists. The amount stolen from the workers is called surplus value, which is the value of the goods produced by the workers minus their wages and the value of the raw materials and other values used up in the production process. Thus surplus value and the fact of the exploitation of labor by the capitalists are immediate consequences or corollaries of the fundamental contradiction of capitalism. Second, the fundamental contradiction of capitalism is the basic explanation for the existence of the two major social classes in capitalist society, the working class (proletariat) and the capitalist class (bourgeoisie). Classes, in the Marxist understanding of the word, are defined principally by the differing relationships of distinct groups of people to the means of production. The relationship of the workers is that they only use the means of production to create surplus value, while the relationship of the capitalists is that they not only own the means of production, they also then own the commodities which “their” workers produce. Third, the fundamental contradiction of capitalism is the basic cause of the class struggle between the workers and the capitalists. Not only does this lead to constant labor turmoil at one level or another, it is the basic motive force that eventually leads to proletarian revolution. Sometimes it is said that the fundamental contradiction of capitalism is itself the struggle “between labor and capital” or the struggle between the proletariat and the bourgeoisie. But this is actually only one of the several concrete corollaries of the contradiction between social production and private appropriation. Fourth, at a more abstract level, the fundamental contradiction of capitalism, as by far the most dominant form of commodity production, results in the deep abstract contradiction between use value and the value of the commodity. This distinction is of great importance in explicating the nature of capitalism. Sixth, the fundamental contradiction of capitalism explains why capitalism has no real solution to the fact that rapid improvements in technology (including automation and artificial intelligence) are leading to the disappearance of more and more jobs. The capitalists need fewer and fewer workers to produce ever greater amounts of commodities. As workers lose their jobs markets diminish, even if those laid off somehow manage to barely survive on handouts and very limited government welfare. Seventh, as Marx pointed out, this fundamental contradiction of capitalism explains why, ultimately, capitalism must prove to be only an temporary and transient form of human society. Commodities are things produced to be sold in a market. The workers who collectively make the products have human relationships with each other, and they have a very different sort of negative personal relationship with their boss who exploits them (in a capitalist system of commodity production). It can even be said that these workers in some sense have sort of a personal relationship with the goods which they have put their minds and efforts into making. But on the other hand, when consumers (workers or not) confront commodities in the market place, they confront them not as human relationships in any way, shape or form, but only as mere objects for sale. So the fundamental contradiction of commodity production is between the human relationships of those who produce the commodities versus the totally impersonal relationships these commodities then present in the marketplace. The social world of production is turned into the cold and impersonal world of markets and market forces. Marx called this loss of social and human relationships in the commodity marketplace, and the process whereby the products of human labor come to be seen as an independent or even alien reality unrelated to the people who make the products, commodity fetishism. As used by Lenin, this refers to the necessary conditions which must exist for there to be a successful social revolution in the capitalist era. “The fundamental law of revolution, which has been confirmed by all revolutions and especially by all three Russian revolutions in the twentieth century, is as follows: for a revolution to take place it is not enough for the exploited and oppressed masses to realize the impossibility of living in the old way, and demand changes; for a revolution to take place it is essential that the exploiters should not be able to live and rule in the old way. It is only when the ‘lower classes’ do not want to live in the old way and the ‘upper classes’ cannot carry on in the old way that the revolution can triumph. This truth can be expressed in other words: revolution is impossible without a nation-wide crisis (affecting both the exploited and the exploiters). It follows that, for a revolution to take place, it is essential, first, that a majority of the workers (or at least a majority of the class-conscious, thinking, and politically active workers) should fully realize that revolution is necessary, and that they should be prepared to die for it; second, that the ruling classes should be going through a governmental crisis, which draws even the most backward masses into politics (symptomatic of any genuine revolution is a rapid, tenfold and even hundredfold increase in the size of the working and oppressed masses—hitherto apathetic—who are capable of waging the political struggle), weakens the government, and makes it possible for the revolutionaries to rapidly overthrow it.” —Lenin, “‘Left-Wing’ Communism—An Infantile Disorder” (April-May, 1920), LCW 31:84-85. 1. [In general:] A trend, movement or attitude which stresses strict and literal adherence to some original set of basic principles and which will therefore accept no alterations whatsoever to those original beliefs no matter what good reasons and arguments are presented. In other words, fundamentalism is one major type of extreme dogmatism. 2. [Within Protestant Christianity:] (Also called Evangelical Protestantism.) A movement and doctrine, which developed originally mostly in the 20th century, which rejects most of the concessions that Christianity has been forced to make over the centuries to science and to the more modern ways of thinking (such as acceptance of evolution and having equality between men and women) and seeks to return to the literal interpretation of the Bible, with all its primitive and reactionary conceptions and biases. This form of Christian fundamentalism has been especially rampant in the U.S., though even here it is now beginning to decline somewhat. (See: RELIGION—Decline Of In The U.S.) Christian fundamentalism, like other religious fundamentalisms, often has strong tendencies toward fascism. 3. Similar anti-scientific and dogmatic trends within other religions, such as Islam, Judaism, Hinduism or Buddhism. The trend toward Islamic fundamentalism has been fostered in part by the development of Political Islam. This is a reaction against the dismal failure of both moderate Islamic groups and secular groups in Islamic countries to effectively struggle against foreign imperialism. While it is understandable from a political perspective why such Islamic fundamentalist trends have developed, their reactionary characteristics (such as intensified oppression of women, murderous attacks on people of other religions, and opposition to a scientific world view) will also lead to their own total failure in the end. 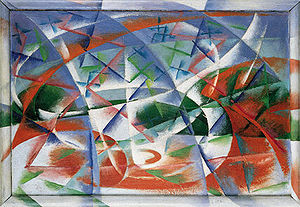 An Italian school of bourgeois literature and then of “modern” abstract painting, starting around 1909, that glorified the machine age, modern capitalist society, patriotism, violence and war. Most of those involved with it were supportive of the rising fascist trend in Italy, and from 1922 on Futurism became part of the official fascist cultural offensive. Futurism also had influence internationally, and even in the early Soviet Union [see CONSTRUCTIVISM], though there were attempts there to divorce it from fascist ideology and connect it to proletarian ideology. Even so, Futurism was almost always most reflective of bourgeois cultural interests and ideology.